With the release of Automatic Duck as a free product there really isn’t a great reason to use this script except as an example of XML parsing and Comp creation from parsed properties. For general FCP to AE workflows I’d recommend downloading Automatic Duck Pro Import AE 5.0. 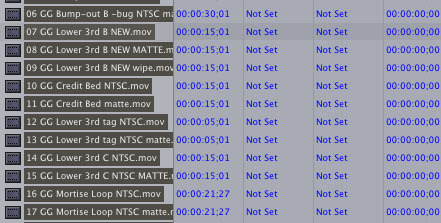 Depending on what happens with FCPX and After Effects I may write new tools for import from FCPX. One of the most popular pieces of content here is Moving Between Final Cut Pro and After Effects: The Scripting Option. I think the idea of using scripting to move between Final Cut Pro and After Effects resonated with people working in a production environment. Unfortunately, the post was more of a tech demo of the kinds of things that were possible with After Effects scripting and less of a practical demonstration for non-technical users. I still urge non-technical folks to dip their toes into the scripting waters, it can be really rewarding, but the challenges presented in “rolling your own” in this situation may be a bit much. So, I decided to write a small application to provide a way for readers who don’t want to deal with the scripting hassle to use some of the techniques I described in the article. Looks like Apple’s chocolate is in Adobe’s peanut butter, or is it the other way around? Import Motion Files Into Adobe After Effects is an Apple tutorial on how to bring Motion files into After Effects. The cool thing about Motion files is that the project format is a well formed XML file that Quicktime understands how to render. That’s how you get cool products like Digital Heaven’s Automotion. If you’ve got more of a DIY bent, that also opens up a lot of possibilities for creating cool projects via XML transforms and scripting. More to come as I explore some of the possibilities. While I was researching, it looks likes the folks at motionsmarts have already been hard at work with cool scripts for Motion. After Effects Position to Motion Position script looks particularly useful for the kind of stuff I do. Apple is hosting an online seminar on creating rich media podcasts with Final Cut Pro. It’s a nicely paced tutorial with a lot of useful information marred only slightly by too many required fields in the registration. Interface gripe – Is anybody else tired of web forms with every country in the world included in alphabetical order and the most common countries like I don’t know, the US and the UK requiring days of scrolling. I’m sure all those users in Antarctica are happy to not scroll. Click the menu once and release mouse. Press a letter on the keyboard and the list will scroll to it. It’s a beginner level tutorial, but you’re likely to pick up at least a few tips. I’ve gotten to where I play this kind of stuff in the background while I work as an alternative to music. Yeah, I’m a geek. So, What’s This Final Cut XML Stuff Good For? Since I’ve been posting about Final Cut XML for a while, I’ll occasionally get a, “so this Final Cut XML stuff seems pretty cool, but I can’t imagine what kind of stuff I might do with it” comment. And I’ll admit, it can seem sort of esoteric. You’ve got this spec and cool new stuff like Apple Event support but until you start to see practical examples you can’t wrap your mind around it (although I’ve tried to start the ball rolling with things like my sequencing utility). ..and that’s just a for instance. There is really a ton of juice here and the tools for technically minded folks with help from people like David to really get a lot of “what ifs” off the ground. Phillip Hodgetts writes an exhaustive overview of Final Cut XML at kenstone.net. Phillip covers an overview of XML, some currently shipping products that support Final Cut XML, and speculates on future applications of the standard. It’s a really good read and a great overview for anybody hoping to get their head around the possibilities of Final Cut XML. Have you ever had a bunch of Quicktime movies or Image files that you needed to lay out in Final Cut Pro? Maybe you’re making an element tape for delivery to a client, or prepping a bunch of lower thirds and titles for your program. I find myself doing this kind of thing all of the time, and they all follow a certain set of rules. Something like, each element should be at 5 second intervals with a minimum of 5 seconds between each element, rinse and repeat. If you’re like me, you grab all of your elements throw them in a timeline and do the Carpal tunnel inducing dance of the up/down arrows. There has to be an easier way right? Well, with Final Cut XML, there really is an easier way. 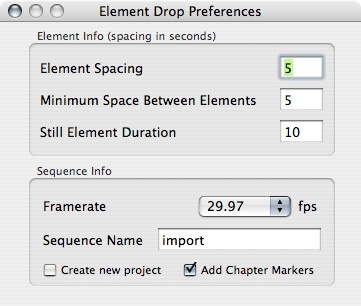 Element Drop is a super simple drag and drop application that lays out a Final Cut timeline of Quicktime movies or Images. Drag and drop a bunch of elements on the application and Final Cut Pro is launched and each element is layed out in a timeline based on user preferences. Chapter Markers can be included for super easy approval DVD’s (Tutorial to come). There are a lot features like Auto-filled Slates, Automated Log Generation and Timeline Database Integration that I can see adding, and I’d love to hear feedback on features as well as bugs. 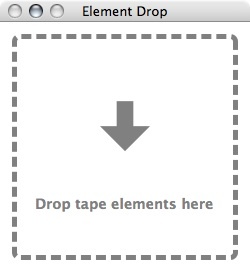 Element Drop only works in OS X 10.4 (Tiger) and above and should work with Final Cut 4.5 and above. The application uses Spotlight metadata to identify files, so in this version you will need to drop elements from indexed volumes, I’m considering using file extensions to identify files as a fail safe in future versions. Thanks for all the initial feedback it’s been very helpful. There turned out to be a couple of show stopper bugs related to sorting, drop frame calculations and file discovery that I am currently working out. I’ve updated the expired beta, but at this point it is more of a tech demo of the direction I’d like to see the utility follow than a useful tool. Feel free to download it and report bugs and features. I’m also working on a detailed bug list so you can see limitations. beta 3 Fixed file sorting problem, this makes the beta usable again. Still working on drop frame calculations and more robust file discovery. beta 4 Modernized interface with focus ring feedback. Need to fix: drop frame calculations and file discovery by extensions. Please send beta feedback and bugs to dale(at)creative-workflow-hacks(dot)com. AppleEvent commands to communicate with and control Final Cut Pro. QuickTime metadata to identify and process movie files. Version 3 of the Final Cut Pro XML Interchange Format to access and modify the contents of sequences in Final Cut Pro project files. Once configured properly, MovieAssembler monitors a watch folder for newly copied media files, using ID tag(s) stored as metadata to specify if and where a particular media file should be inserted into a selected sequence. All of these operations, while performed in Final Cut Pro, are initiated and configured from the MovieAssembler application. This is really good stuff. I’m just getting back to having time to explore FCP Interchange, and I’m having some pretty good results which I hope to demo here soon. I like the watch folder idea, which seems to match my thoughts that, at least in this version, these apple events are best suited to asynchronous work like chron jobs. My hope is that in the next version we get an FCP specific dictionary so we can interact real time with the FCP UI. There are a lot of ways to refamiliarize yourself with the content. Open up clips in the viewer. Throw them in a sequence. Check out the Finders Quicktime preview. One method that I find quite handy is to use FCP’s Thumbnail scrub feature. Apple released Final Cut Pro 5.1.2 (pdf link) which addresses a lot of the problems that I’ve been running into lately. I want to take a bit of time to dig into the extensive bug fixes, and folks are already doing just that, but one change that I was not expecting really caught my eye. A new version of the Final Cut XML interchange format introduced some new elements. If you develop a rich catalog of media and a strong database you should be able to build, replace and alter projects based on your workflow using elements like replaceiffound which replaces a target component if found. and addifnotfound which adds the imported component to the project provided the target component is not found. Combine that with adding and altering metadata in Quicktime files your workflow can really be enhanced. Obvious stuff like all files for a project as well as non-obvious, fuzzier ideas like all clips in a certain color range. Very cool. Time to dig in. UPDATE: 09-27-2006 So, the glue that will hold this together is a set of 7 apple-events to use as an interchange between your custom app and FCP. Lots of possibilites. Download the sample app here. SECOND UPDATE: 09-27-2006 Well, it looks like this gets us part of the way there. The apple-events seem to work nicely for sending to FCP, but it still doesn’t have an applescript dictionary which I think means we won’t be sending anything (like maybe the selected clips in a sequence) from FCP with this update. What that means is you’ll be able to do cool batch processing on the days work as a chron job and have lots of interesting data, but won’t be able to do things like space elements in a sequence unless I’m missing something. There are some private and undocumented data interchange protocols, but those require reverse engineering and are going to be out of the scope of your average power user or scripter.If anybody knows more please post a comment. Inaccurate Scopes in Final Cut Pro Workaround? Interesting post from Shane Ross about some monitoring problems in FCP. So we cancelled the output and tried to figure out what to do. The engineer…my buddy…had a solution. And this is a nifty workaround (Workaround #214 for those keeping tally of needed FCP workarounds to get things working properly) for those of you taking notes. EXPORT VIA QUICKTIME CONVERSION. Make the settings match those of your project exactly. When you re-import that footage and drop it in the timeline above the originals, you will find that the conversion has chopped off the portions that are above 100IRE, and clamped (chooped, whatever) the portions that go below black. In other words, it does what Broadcast Safe should do, but doesn’t really do. We’ve been struggling with inconsistent monitoring in our After Effects to Final Cut through AJA Kona products workflow. Particularly interesting has been the vast differences between the digital scopes in Color Finesse in After Effects and the digital scopes in Final Cut and haven’t been sure which was going awry. I’ve seen less of a problem in our monitoring using hardware scopes and Kona throughput. I’m not sure if I’d want to do a Quicktime conversion on every element that went to tape, but it is an interesting observation. I hope a lot of this stuff is just a new generation of gear and software and gets worked out soon, but anecdotally I’ve been struggling to get consistent color workflows. Anybody else? > do precious little to guide one towards best practices. xform. Kinda makes the whole system seem bogus. And you’ve got a big case of Yikes! going. If these guys can’t get it right, how am I supposed to? UPDATE: 09-26-2006 Mike Curtis has an extensive post and comments followup on these issues. All signs seem to be pointing to a QuicktimeYUV/RGB conversion issue. I’ll try to followup with a post or point to a distillation of how to work with these issues once a consensus is available.